Background: Rheumatoid arthritis (RA) is an autoimmune disease that may lead to joint destruction and disability. Wingless (Wnt) pathway is involved in bone formation and has been found to contribute to bone loss in RA. Sclerostin is a key molecule in Wnt pathway. Objective: To study the serum levels of sclerostin in rheumatoid arthritis patients and to study its association with radiological changes. Methods: Forty-five patients with RA and 45 age and gender matched healthy controls were enrolled. Serum sclerostin was measured by ELISA. Modified version of Larsen score was used to assess joint damage in radiographs and Magnetic resonance imaging (MRI) of wrist and hand was assessed for synovitis and bone erosion. Results: Serum sclerostin levels were higher in patients with RA as compared to controls (p < 0.01). Serum sclerostin levels correlated with ESR (r = 0.655), CRP(r = 0.623), modified DAS 28 (r = 0.711), MRI synovitis (r = 0.802) and MRI erosion score (r = 0.832). Conclusion: Increased serum levels of sclerostin may play a role in joint damage and bone erosion in RA. Aim: To study correlation between QT interval parameters (QTc interval & QT dispersion) and disease activity (SLEDAI) in patients with systemic lupus erythematosus (SLE). Methods: The study was done on 100 newly diagnosed patients with SLE and 100 age matched controls from January 2012 to December 2013. A standard 12 lead Electrocardio- gram was obtained. QT interval was calculated from beginning of 'q' wave to end of T wave in lead II or lateral leads (V5, V6). QT dispersion was measured as the difference between maximum and minimum QT intervals. SLE disease activity was measured SLEDAI. Results: Eighty four patients had high disease activity. QTc was > 440 msec in 51 patients and 6 controls. QTd was prolonged in 6 patients and 6 controls. The mean QTc interval among patients (463.30 ± 27.43 msec) was higher than in controls (397.24 ± 31.85 msec; p < 0.001). However the mean QTd among patients (44.40 + 20.61 msec) was similar to that in controls (39.2 + 17.7 msec). Difference of QTc values during severe flare from baseline QTc values was statistically significant (r = 0.863; Pearson's correlation coefficient). Conclusions: Patients with high disease activity have higher prevalence of QTc prolongation, QTc interval may be used as a surrogate marker for assessing disease activity in SLE. Background: Patients of systemic lupus erythematosus (SLE) are known to have poor quality of life and high levels of fatigue. However, there is limited data on patients with SLE having low disease activity; thus this study looked at theses aspect in Indian patients with low disease activity. 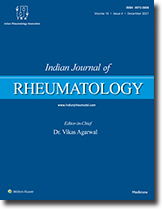 Methods: This was a cross-sectional study that included consecutive SLE patients having low activity disease (systemic lupus erythematosus disease activity index :::4). Past major organ involvement and current medication was noted. Controls were recruited from hos- pital staff. Subjects were administered SF-36v2, WHOQoL-BREF, FACIT-Fatigue subscale and HAQ-DI. Results expressed as mean ± SD and compared by students t test. Corrected p value (p < 0.05) was considered significant (corrected for multiple comparisons). Results: This study included 60 patients with SLE (F:M = 55:5) with mean SLEDAI being 0.9 ± 1.6, and 28 controls (F:M = 24:4). Both the groups had similar age (30.1 ± 9.3, 27.7 ± 7.7 yrs, p = 0.27). Patients had poorer quality of life compared to controls in all domains of SF- 36v2, with lower physical (45.0 ± 9.9, 55.7 ± 3.7, p < 0.01) and mental component summary scores (46.5 ± 11.0, 54.7 ± 6.4, p < 0.01). WHOQol-BREF scores in all domains were lower in patients. Patients had higher fatigue, i.e., lower scores on FACIT-Fatigue subscale (36.8 ± 13.0, 50.5 ± 2.4, p < 0.01) and worse HAQ-DI (0.4 ± 0.6, 0.0 ± 0.1, p < 0.01). Patients taking prednisolone :::7.5 mg per day (N = 45) had a significantly less fatigue thus a higher FACIT score than compared to those on higher doses (FACIT-fatigue score 39.9 ± 10.6, 27.1 ± 15.4, p = 0.03). Conclusions: Despite having low disease activity, SLE patients had worse quality of life and high fatigue levels. Fatigue may have an important role in the impaired quality of life in these patients. Objectives: To investigate the differences in clinical presentation, disease activity, HLA-B27 positivity in nr-axSpA and AS. Methods: Prospective observational study conducted in tertiary care centre from India. Total 125 consecutive patients with chronic low backache were screened,96 fulfilling ASAS criteria for axial SpA were included and grouped into radiographic (AS) (n = 55) and non- radiographic (n = 41) axial SpA. Demographic, clinical, disease activity and functional indices, ESR were noted from study group. HLA B27 testing was performed in study group by using an in-house PCR method. Results: Patients with AS compared with nr-axSpA were older at presentation (mean 33.7 ± 11.9 vs 26.5 ± 9, p < 0.001), longer mean time to disease diagnosis (4.4 ± 4 vs 1.3 ± 1.7,p < 0.0001) and had higher proportion of positive family history of SpA(29% vs 9.7%,p = 0.02). No statistical significant differences were found in male to female ratio, peripheral arthritis, dactylitis, enthesitis, ESR, HLA B27 positivity, disease activity and functional indices (BASDAI,BAS-G&BASFI) Conclusion: Though the clinical features and HLA B27 frequency is similar in nr-axSpA and AS, Patients with AS were older and had longer disease duration. The ultimate goal of pharmacological treatment in Rheumatoid Arthritis (RA) is to reach and sustain remission, prevent functional disability and organ damage. Recent improve- ments and insights in RA treatment such as availability of wider range of disease modi- fying agents including biological agents have made 'clinical remission' a realistic target for many patients. To optimise RA treatment physicians must monitor the disease activity accurately to adjust treatment according to disease activity levels. In RA, several disease outcomes such as painful and swollen joints, functional impairment and acute phase re- actants are recognized as manifestations of underlying disease process. To monitor the disease accurately, an index expressing these outcomes as a single continuous variable is required. The widely used disease outcome measures in clinical trials are the American College of Rheumatology (ACR) recommended indices: DAS28 (ESR or CRP), PAS, PAS-II, RAPID-3, SDAI and CDAI which have different relevance in clinical practice as compared to clinical trials. DAS28 hitherto considered gold standard in measuring RA outcomes in clinical trials may not hold appeal in clinical practice because of complexities associated with its calculations and waiting time due to inclusion of laboratory measurements. In recent times, simpler scores such as RAPID-3 and CDAI are being evaluated in global and Indian studies as a preferred outcome measure in point-of-care clinical setting because of their simplicity and ease of administration especially in a fund-stricken country like India. Introduction: of magnetic resonance imaging (MRI) in diagnosis and management of in- flammatory arthritides has ushered robust changes in patient outcomes. The efficacy of MRI in detecting inflammation and damage together has raised the expectation of imaging in rheumatology. In-office extremity MRI (eMRI) systems, designed to image the peripheral joints of upper and lower extremities, are small enough to be used in clinics, have smaller fringe magnetic field, are less expensive, and reduce patient discomfort, with comparable diagnostic power. Though less sensitive in detecting osteitis, these systems have been shown to be effective in early diagnosis and monitoring of treatment outcome in patients with rheumatoid arthritis. This review focuses on eMRI systems, outlining their principle, utility in different inflammatory arthritides, and shortcomings. While the overall scientific publications from the country has improved in quantity and quality over the last decade, publications from medical Institutions continues to be poor. Only a handful of colleges engage in and promote research. There is frustration regarding the lack of financial support for research. This article discusses the reasons for the lack of research in medical colleges, the sources for funding and provides inputs for improving the research climate in the medial education field. We report the case of an 11-year-old girl with juvenile systemic lupus erythematosus (SLE) and severe retinopathy. Her retinopathy was discovered during high SLE disease activity that included neuropsychiatric complications. She was successfully treated with aggres- sive immunosuppressive therapies and plasma exchange.